What Is Fire Damage Restoration – What Can I Expect? Premier Restoration personnel are experts in fire and smoke damage remediation and restoration services, catering to both residential and commercial clients. Our company’s qualified technicians are experienced in all types of fire and smoke damage remediation and restoration, performing all necessary tasks to return your property to its former state: from deodorization, sanitation and cleaning, duct and air vent cleaning and smoke residual removal. Our company services include both damage assessment and sanitizing of your home or commercial property, and the construction and repair work of the damaged structures.You can trust our certified professionals, who will help you through the whole process of control, remediation and restoration. As soon as your residential or commercial property is deemed safe by the fire department or other relevant authorities, all the fire and smoke damage restorations tasks should begin. Otherwise, the acidity of smoke, a byproduct of fire, will keep on corroding all surfaces. If left untreated, fire and smoke damage can have much more severe consequences and be harder to clean, deodorize and remove. Moreover, more often than not, the action of extinguishing the fire causes a great amount of extra damage, in some instances even more harmful than the fire itself. Under such circumstances it is common to deal with water damage in addition to heat and smoke damage. To ensure prevention of further losses, urgent action is essential. To maximize effectiveness, all fire and smoke damage remediation and restoration services must start as soon as possible. Our company is able to respond quickly, preventing further replacement costs. 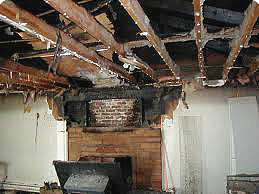 Our fire and smoke damage remediation and restoration services include: assessing the extent of damage, complete sanitation and cleaning, duct and air vent cleaning, smoke residues removal, fire extinguisher removal, oil soot removal, carpet removal, deodorization, sanitation, reconstruction, restoration, boarding up, among others. Our certified professionals are able to identify which kind of fire has occurred, which kind of smoke saturates the structures in your property, and assess the remediation and restoration services that need to be undertaken. All these tasks require expert professionals, trained and certified to offer the best possible service: at our company we have the right person for each one of them. Our certified professionals are experts in fire and smoke damage remediation and restoration services. With our company’s expertise by your side, you are much more likely to avoid property replacement, saving you both money and time. Contact us, our high quality services ensure the best possible results. Got mold in your basement? Let us clean it up!